I’m so excited! 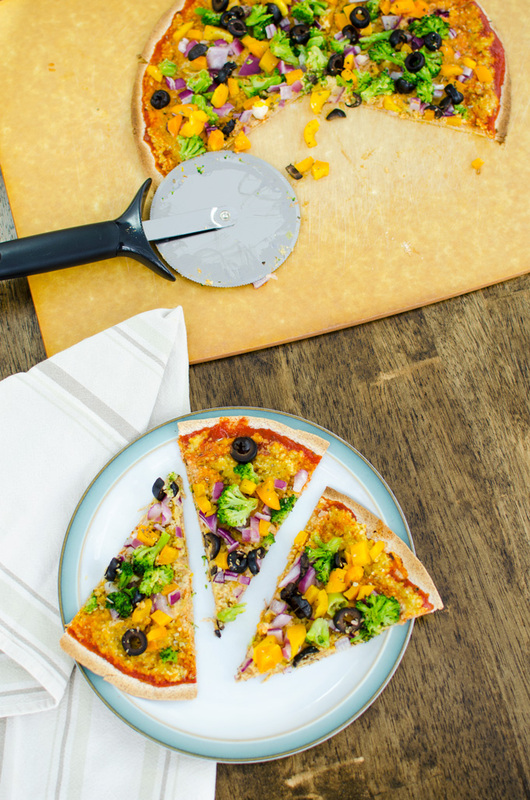 This homemade veggie pizza is absolutely delicious and it’s so easy to make! I’ve been feeling a little guilty because I typically use Daiya cheese to make vegan pizza. While the dairy-free, soy-free, gluten-free Daiya products are fine for an occasional indulgence, my husband and I have gotten into the habit of making pizza nearly every weekend. The Daiya cheese was becoming too much of a good thing because, let’s face it, processed food is processed food whether or not it’s vegan. I’ve been meaning to try making pizza with cashew cheese. After exploring some different options I decided The Blender Girl’s Basic Raw Cashew Cheese recipe is perfect for pizza because the consistency resembles ricotta cheese. I gave it a try and I am thrilled with the results! Additionally, a local restaurant, Aroma Thyme Bistro, was kind enough to share the secret to their thin pizza crust the last time I enjoyed their delicious Vegan Hummizza. 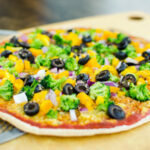 They inspired me to use a whole wheat or gluten free tortilla for a quick and easy thin pizza crust. The trick is to cook the pizza on a pizza screen so the crust becomes nice and crispy. 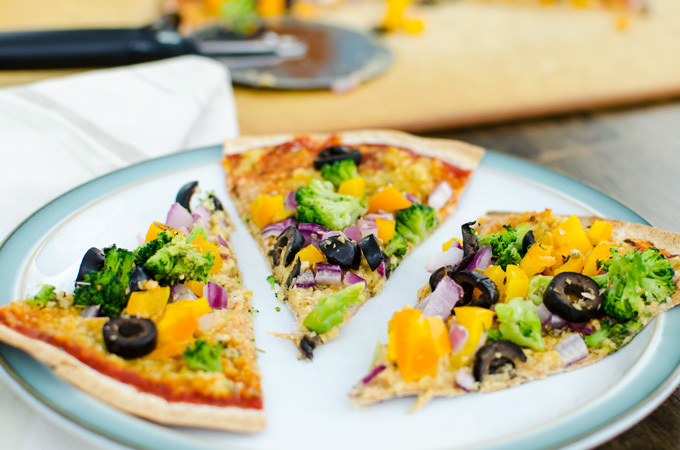 I couldn’t be happier with this quick and easy homemade veggie pizza recipe – it offers a wonderful cheesy taste with healthy fats and protein. I think I’ve found my new favorite lunch! Place the tortilla on a pizza screen. Spread pasta sauce evenly over the tortilla – to within ¼ inch of the edge – with a spoon. Spread cashew cheese evenly over pasta sauce. 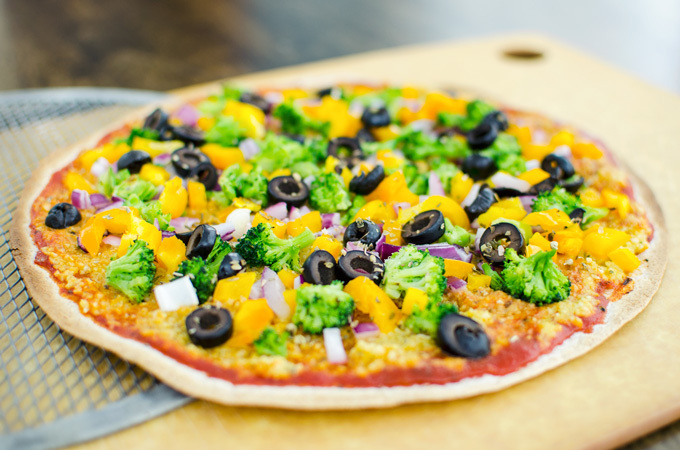 Sprinkle chopped onion, peppers, broccoli and black olives evenly over cashew cheese. Shake dried oregano and basil over chopped vegetables. Place pizza screen on the center rack of the toaster oven and bake for approximately 5 minutes or until the edges of the crust appear brown and crispy. Slide cooked pizza from pizza screen onto a cutting board. Slice with a pizza cutter and enjoy! To quickly thaw the frozen broccoli florets, microwave for 1-2 minutes. Cooking time and temperature are based on my Breville Toaster Oven, time and temperature may need to be adjusted if you are using a different toaster oven or a conventional oven.